Seeds germinate in 3 to 14 days depending on how warm and moist you keep them. Seed tomato seeds directly into potting mix, they must be kept at a temperature of 60 degrees F. Cover seeds 1/4 inch deep. Potting mix should be made up of peat, perlite and lime. We use Sunshine #4 (Organic), Transplant into 4” pots with a rich potting mix ( ½ potting soil, ½ compost plus 1 T. per pot soil amendments) when they have their true leaves – about 10 to 20 days. Cultivars may have a determinate plant structure, growing only to a given height; while others show indeterminate or continuous growth until killed by frost. Generally, the earlier maturing cultivars are determinate and most of the heirloom tomatoes are indeterminate. If you have a good seedling set up with warm and cool florescent or gro-lights and even better, a heat table, you can start your seeds in late February or early March right up until mid-April. Seeds under ideal conditions will be ready to transplant in about 10 days, once they have their true leaves. Seeds need warmth, moisture and a light potting mix to germinate. We use plastic lids to keep the soil moist. Once they have their true leaves, they need to be transplanted into larger pots with nutrients such as compost offers plus alfalfa for N, rock phosphate or guano for P, and kelp meal for K. The transplants can be put into the ground in an unheated greenhouse at the end of March or outside at the end of April. You can continue planting your tomatoes into early July but plant only early tomatoes at that late date. Tomato plants should be planted in full sun for optimum fruit development and high production. Fertile, well-drained soil is best. Provide wind protection. Plants may be grown in large containers, but will need more attention as the soil tends to dry out quickly. Greenhouses or overhangs are good to combat late blight and get an early start on ripening. Potted plants being transplanted should be watered well the morning before transplanting. Prepare the soil by digging a hole 10” deep, Add compost and an organic mix of fertilizer which is low in nitrogen about 1/2 cup per plant. Fill the hole with water. Transplant hardened seedlings into the garden when the risk of frost is low. Soil should be 50 to 55 degree F . Protect the plants with floating row cover or plastic covers while our evenings are still cold. Set the plants slightly deeper in the soil outdoors than they were growing in the container. If the plants are tall, you can set them as deep as the second set of true leaves. Turn the pot upside down supporting the plant and tap the bottom of the pot gently. The plant should come out easily. Press the soil firmly around the plant to form a slight depression to hold the water. Water the plants in so the soil will settle around the roots of the plant. Distance between plants depends on two things: cultivar and growing method. Set unstaked plants 3 feet apart in rows 4 to 5 feet apart. If the plant will be staked, plant them 18 to 24 inches apart in rows 3 feet apart. Caged tomatoes are best spaced 24 to 36 inches apart in rows 4 feet apart. Tomatoes need about 1 to 2 inches of water each week. This varies according to temperature, type of soil, rainfall and whether a mulch is used. Sandy soils, for example, require more frequent watering. Heavy weekly soakings are better than frequent light soakings that tend to maintain shallow root systems. Mulching helps reduce water loss. Tomatoes appreciate when you use tepid water rather than cold water. Staking, training or placing cages around the plants makes it easier to harvest, keeps the tomatoes off the ground and allows air circulation. When staking plants, use wooden stakes about 8 feet long and 1 1/2 inches wide. Insert the stakes about 4 inches from the plant. Do this soon after transplanting to prevent root damage. Set the stakes 1 1/2 to 2 feet deep for good support. Tie strips of cloth, nylons, soft cord or commercial ties around the stake and under leaflet branches about every 12 inches up the stem. You also can tie the cord to the stake 2 to 3 inches above a leaflet branch, then loop the cord loosely around the main stem and tie it to the stake below the branch. Tomatoes also can be supported by enclosing them in cages constructed of wire or wood. The size of the cage varies with the type of plant. A cage 4 to 5 feet tall and 14 to 18 inches wide will support most plants. Nearly indestructible cages can be made from concrete reinforcing wire mesh. The 6-inch square openings make it easy to harvest even extra-large fruit. For a cage 18 inches in diameter, cut the wire in 4.75 feet lengths and form each into a circle. To make cages of other diameters, use the formula for the circumference of a circle. Bend the end wires to hold the cage together. If you use another type of wire mesh, make sure the openings are large enough for your hand to fit through while holding a large tomato fruit. Place the cages over the young plants and stake the cage to the ground to guard against wind damage and breakage. Electric fence posts make sturdy, inexpensive stakes. Check the plants weekly and adjust the main stem so it grows inside the cage and not through a side opening. You can also train the plant up a string that hangs down from a support at least 6’ high in your greenhouse, winding the string gently around the stem as the plant grows. As the plants grow, remove the “suckers” or side branches and tie the main stem to the stake. 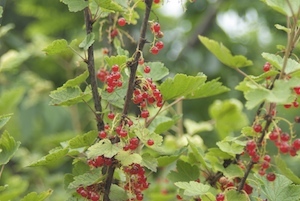 Be careful to remove the suckers and not the fruiting stems or leaflet branch. Suckers appear at the point where the leaflet branch joins the main stem. Do not remove suckers from cultivars with a strongly determinate growth pattern. Team tomatoes with onions and basil, lettuce, radishes , bush beans and cabbage, asparagus, marigolds, nasturtiums, and parsley. 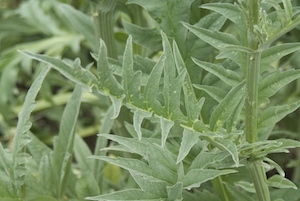 Asparagus, marigolds and basil help repel insects. Nasturtiums can lure aphids away from tomatoes. Parsley and basil enhance tomato growth and flavour. Our main pests are cutworm, blight, aphids, blossom end rot and dampening off disease. We collect the cutworms with a morning patrol stirring the soil around the base of the plants to find the cutworms. You can also put collars around the base of your plants to keep the cutworms from climbing up the stem of the plant. We avoid blight by providing good air circulation, bottom watering, and keeping the plants covered if we have 48 hours of rain in the summer and also rotating our crops. Aphids are lured away with nasturtiums and plants are not fed too much Nitrogen. Blossom end rot is a calcium deficiency aggravated by excessive water or nitrogen. Dampening off is prevented with carefully controlled bottom watering of potted plants allowing the soil to dry out between waterings. 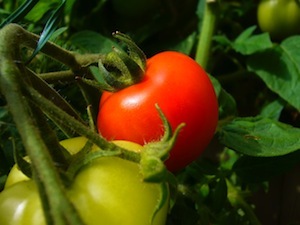 Choose very ripe tomatoes from your strongest most productive plants. You can eat the tomato saving the seeds and a bit of the flesh which you put into a cup with a little water for 4 to 8 days to ferment. The good tomatoes fall to the bottom and you can drain off the mold and flesh. Dry on a paper plate and soil in a dry cool place. Only use open pollinated tomatoes. Very little crossing happens between tomato plants. By Mary Alice Johnson and Marika Nagasaka of ALM Organic Farm. To download or print these instructions, click here, then click the download arrow or print icons on the top right of the screen. This entry was posted in Uncategorized, VW Urban Farmers. Bookmark the permalink.